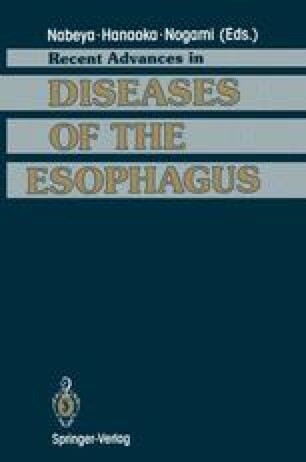 Formerly, the purpose of the non-shunting operation was to eradicate esophageal varices completely. Although most patients who received the complete operation of transthoracic esophageal transection and gastric devascularization (the Sugiura procedure) could achieve eradication of esophageal varices, patients who only received esophageal transection or gastric devascularization because of limited hepatic functional reserve showed a higher chance of residual or recurrent varices . After induction of endoscopic injection sclerotherapy (EIS) treatment strategy for esophageal varices varied dramatically. Although some authors reported that EIS is more than palliative treatment for esophageal varices, some reported high incidence of re-bleeding following EIS [2, 3]. There may be a place for combined therapy employing non-shunting operation and EIS for the treatment of esophageal varices. Based on our clinical experience with 132 non-shunting operations and 80 EISs for esophageal varices due to liver cirrhosis, the significance of combined therapy of both methods was studied referring the limitation of those two kinds of treatment.